After a hiatus, the near-billionaire wallet owner is back to bitcoin mitosis. About half of all bitcoin in existence have been moved sometime in the last 12 months, but almost 20% haven't been touched in at least 5 years. Most of these are probably lost forever, to thrown-out drives, crashes, forgotten passwords and other misadventure. But there are still some old wallets kicking around, containing a fortune in bitcoin and Bitcoin Cash and other forks. One of these, a wallet holding 111,114.62 BTC and BCH worth almost US$900 million, rumoured to be related to Silk Road, has come to life. By all appearances it looks like it's trying to move inconspicuously, without too much success. Reddit user sick_silk has spent an enormous amount of time and effort meticulously tracking the money as it's moves. It all started as one wallet about 5 years ago, which divided and subdivided itself at the time. Now, after a moderate dormant period, it's kicked into action again and started dividing funds. They assembled the diagram below, to visualise the movements. Let's take a brief tour. 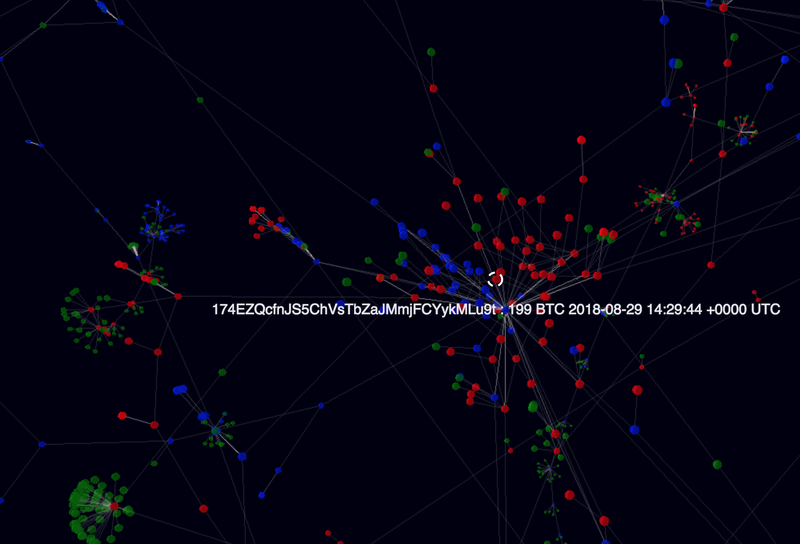 Each coloured bubble is a wallet address, colour-coded by how recently it was active. The prominently circled address in the top right is the originating wallet. The immediately connected green dots are the original splitting of funds all those years ago. Those artistic green explosions throughout the piece are where funds were moved into a single separate wallet over a year ago, and then from that single wallet subdivided into several other wallets where the funds were left. Over a year ago, that seemed to be this person's favoured way of dividing the funds. They'd move a large chunk to one wallet, and then from that wallet would siphon them out into a dozen-odd other wallets. The blue movements within the last year show mostly show a different technique, of either moving funds between wallets, or constantly subdividing the funds while moving them. This creates those literal "strings" of addresses. A similar thing can be seen with the string of red beads in the bottom left. This is the wallet at the very end of that string. 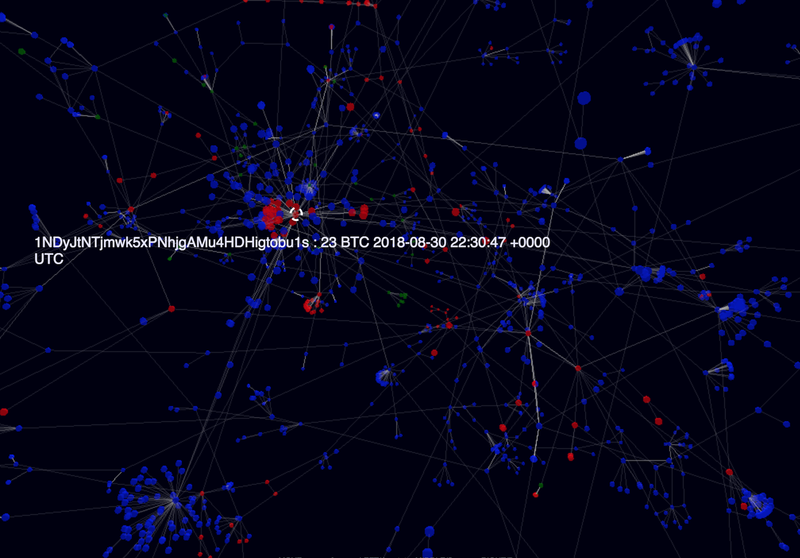 If you follow the transactions chain back up, you can see that the last few transactions have just been moving all the funds (about 8BTC) from one wallet to another, with occasional splitting as you go further back. That all the BTC is being moved suggests it's the same person controlling the funds along the way, and the constant bouncing from wallet to wallet which seems to serve to discernible purpose looks a lot like an attempt to muddy the waters. That big cluster in the centre is an exchange. Binance, to be specific. Get a bit closer, and you can see just how many wallets there are. Get much closer (red was moved in last 24 hours at the time of creation, here) and you can really get a sense for the hundreds and hundreds of different wallets involved. These are gradually trickling their way around the internet and to exchanges, being sold in small amounts at a time. If nothing else it shows how hard it is to move that much bitcoin without being noticed, and how closely the internet is watching. As with the Mt Gox coin movements, some are worried about a price dump following a sell off of hundreds of millions worth of bitcoin. But judging by the careful and methodical steps taken by the wallet owner, they'd rather tread lightly. Whether it's light enough is anyone's guess. Binance requires verification for withdrawing funds, so unless the wallet owner has actually given some kind of identification the most likely guess is that they're trading the BTC for altcoins, such as Monero, to better cover their tracks going forwards. Bitcoin really might be the worst way of moving money quietly.